Contacts App manages all your business Contacts, to whom you contact related to business needs (Business to Consumer) flow. 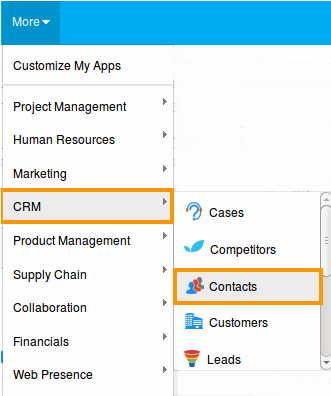 The most important function of the contacts module in Apptivo CRM is that they can be used for both customers’ acquisitions as well as procurement of products from the suppliers (vendors). Contacts can be related to an account as well as suppliers (vendors) according to your business process. This is Business-to-Business (B2B) Business-to-Business (B2B) it is a part of the organization details with which you are doing business. Shared Contacts for Gmail allows you to share your Gmail contacts and groups with specific users within your organization directly from your Google Contacts. Share your Gmail contacts with users, just like you share a Google Doc or Google Calendar. Shared contacts are supported on mobile phones/tablets if you are the user of mobile app. Contacts App doesn’t support your business with Contacts; it comes with many other apps to run your business. All apps are deeply integrated which communicate with one another. The qualified Contacts can be converted as customer, or you can consider them as sales leads of your business. The most common piece of information that businesses need to store is the contact information of the people they interact with. Whether they are customer contacts, industry experts, suppliers, or even just a family member which provides great feedback; managing all of your contacts in a central location is key to keeping a business efficiently. Beyond the importance of managing your personal contacts in one location, it’s even more important for your entire company to have a single address book that employees can share. This ensures your team always has the right information needed to contact those whom your firm does business with. Log in and access Contacts App from your universal navigationmenu bar. Click on “Create” button to create a new contact. Click on “Settings” icon to customize Contacts App. 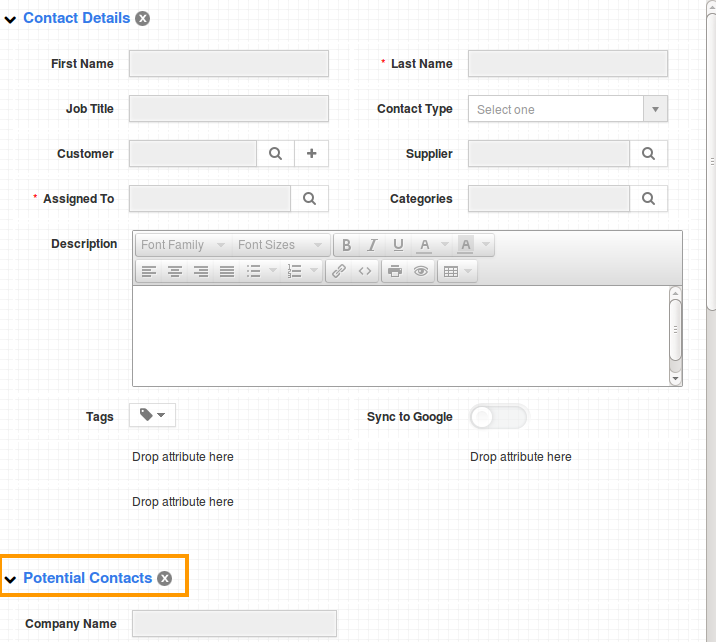 Create your own custom fields to create a new contact. Associate leads and opportunities to contacts using defined sections. Click on “Reports” icon to generate contact reports. Click on “Notifications” icon to customize news feed and email feed. Click on “Import” to import mass contacts from CSV file. You can also duplicate a contact using “Duplicate” feature found in App. Click on “Schedule follow up” to schedule the follow up event with contacts. You can create common activities like appointment, task, call log etc. You can perform simple search and advance search for contacts. Data level access security for contacts. You can share your contact’s custom attributes through customize app. 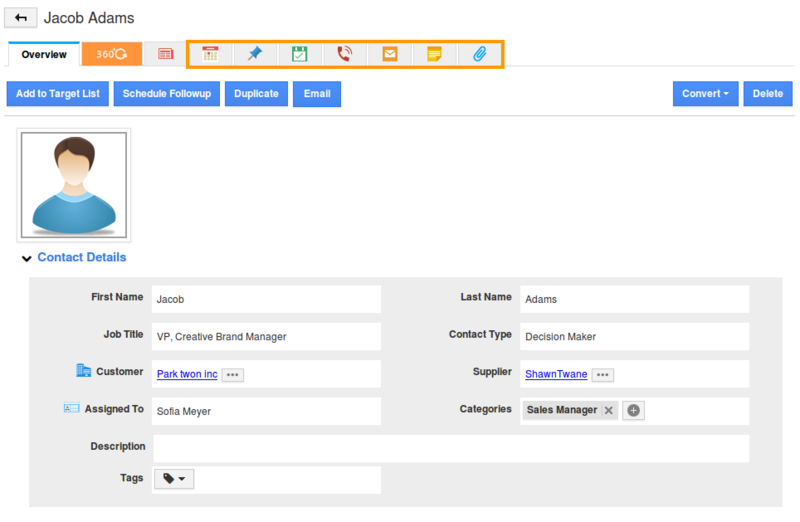 Save your column set to view your preferred contact fields in dashboard. You can also save the current search query as views using “My Views” and also share this views to your contacts through “Shared Views“. First Name- Name of the Contact. You are allowed to enter in your own language in “First Name” text field. Last Name – Name of the Contact. You are allowed to enter in your own language in “Last Name” text field. Job Title – Job title of the Contact. You are allowed to enter in your own language in “Job Title” text field. Customer – Select customer from auto suggestion field. Referred By – Referrer of the Contact. You can choose referred person from drop down list with click of “Search” button. Assigned To – Assigned person of the Contact. You can choose assigned person from drop down list with click of “Search” button. Description – Description of the Contact. You are allowed to enter in your own language in “Description” text field. Tags – Tag of the Contact. You are allowed to choose tags from “Drop down” box (or) Create a new tag with click of “Add New”. 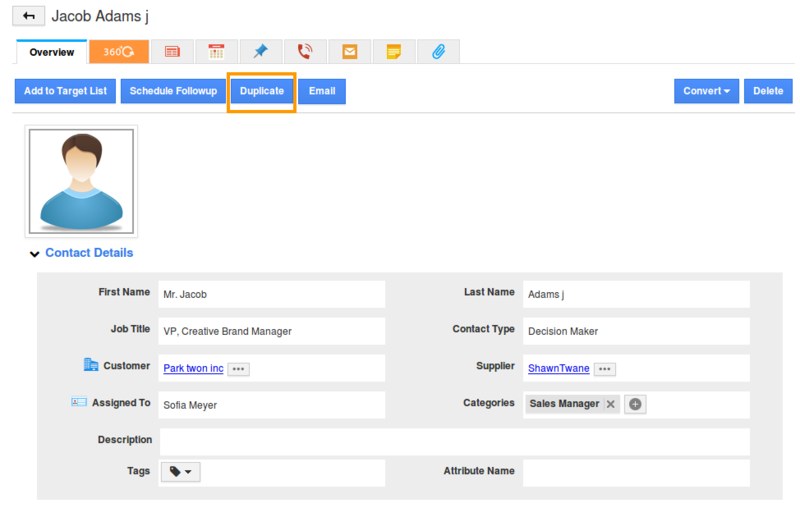 Type – Type of the Contact, the value can be selected from predefined list. 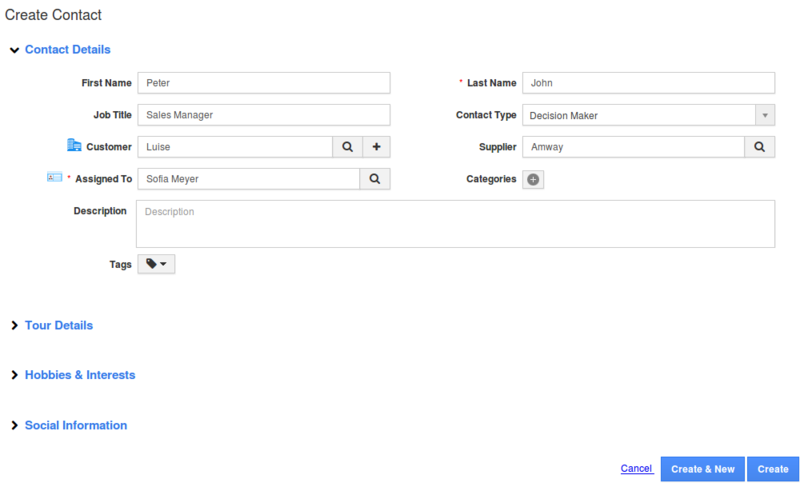 Supplier – Select supplier from auto suggestion field. Phone – Phone number of the Contact. You are allowed to enter N no of digits in “Phone Number” field. Email – Email of the Contact. You are allowed to enter email id in “Email” text field. Skype – Skype name of the Contact. You are allowed to enter skype name in “Skype” text field. Additional Information of the Contact. You are allowed to enter “Additional Information” about the Contact in your own language. Phonetic Name – Phonetic name of the contact. Nick Name – The name which is a short form of the contact’s name. Date of Birth – Birth date of the person. Territory – Territory of the Contact. You can select territory from pre defined list with click of “Search” field. Market – Market of the Contact. You can select market from predefined list or create new market with click of “Add New” in drop down box. Industry – What industry does he belongs? you can select the industry from predefined list or create new industry with click of “Add New” in drop down box. Segment – Segment of the Contact. You can select segment from predefined list or create new segment with click of “Add New” in drop down box. 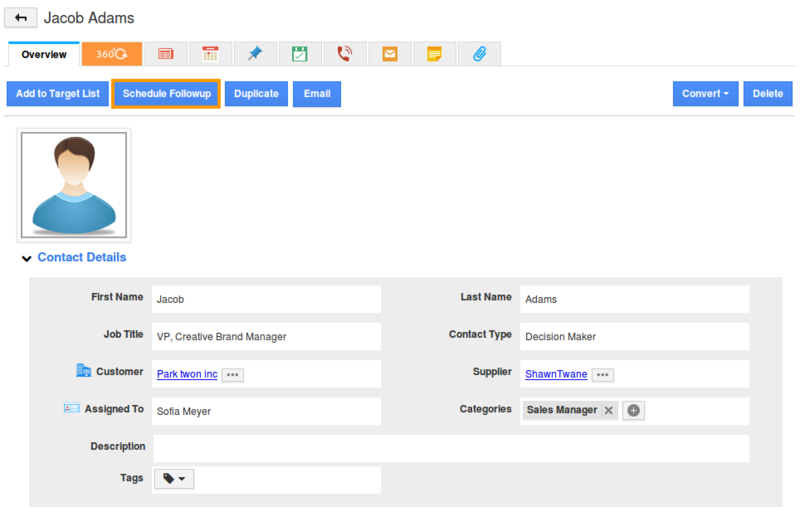 Enter contact information manually in contact creation page. Import contact records from CSV (Note: You can import up to 5000 contacts records at a time). If your account customized with Email to case feature then for each case creation the contact will also be created simultaneously. When lead gets converted to contact, the new contact record will be created. Contacts app allows you to create new Contacts using create contact option. Click on “Create Contact” button from the left navigation panel. First Name – First name of the Contact. Last Name – Last name of the Contact. Job Title – Name of the job.. Contact Type – Choose option for contact. Customer – Select Customer from a search option or create new. Supplier – Select Supplier from a search option. Categories – Select Categories from a search option. Email – Email id of the contact. Skype – Skype id of the lead. Nick Name – Nick name of the contact. Date of Birth – Date of birth of the contact. Market – Select one/Add new. Segment – Select from predefined list. Hobbies – Hobbies of the contact. Food – Favourite food of the contact. Contacts app allows you to import the contacts from your own resource to it, using Import.This will minimize your work of creating Contacts manually. Click on “More” icon and select “Import” icon located at the app header bar. Click on “Browse” button and select CSV file from your computer and click on “Next“. Click on “Import” button to import records. Note: By default “Sync to Google” option is enabled, if you are trying to import contacts in “Contacts Sync enabled” firm as shown in the image below, this allow you to sync contacts instantly with Google. If you want to continue click on “Import” button or click on “Back” button to include common fields. Mandatory Values – Validates mandatory value association. Click on “Proceed” button for each step. You can view the number of records uploaded and failed. In order to support the rest of the sales process it’s time to convert the lead information into the other CRM apps. The conversion of lead into a contact that will be associated with the customer. 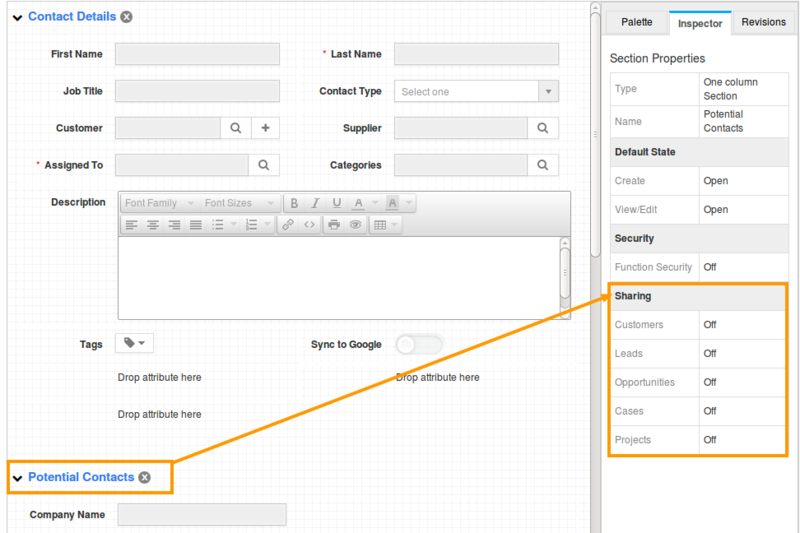 Customize “Conversion” setting to enable “Lead to Customer” conversion. Select a category from a predefined list. You can convert a lead into an opportunity, the standard lead fields are automatically converted to the opportunity. You can convert a lead into a customer, the standard lead fields are automatically converted to the customer. Click on “More” icon and select “Import” located at the app header bar. Click on “From Google” from left navigation panel. You can view new browser window in which enter your Google account user name and password, click on “Sign in” button. Browser window requests for access permission, click on “Accept” button. Import Contacts page appears, select contacts from the list. Click on “Done” button to complete. If your contacts having same email id as in Apptivo. We will not display the same email id contacts in import pop-up. Associate contacts with customers while import. Import contacts from existing email. Import contacts from microsoft outlook. Sync contacts to multiple people. Yes! Contacts App has integrated directly with Gmail and Yahoo to make importing your contacts very simple. You’ll be able to perform the import during the account creation process, or you can import directly from the Contacts App at any time. Click on “From Yahoo” from the left navigation panel. Select your account (Yahoo, in your case). A popup window will open, and your email provider will ask for your login details, and permission to share your contacts. Once you provide this information, a list of all contacts will appear, and you can check the box next to each contact you’d like to import. Click on “Done” button, the import is completed immediately, and all contacts are now available in your app.